This past Friday, our friends in New Mexico formally broke ground on Spaceport America, opening a new chapter in the storied aerospace history of New Mexico. When complete, this new facility will allow this generation’s space pioneers to join the illustrious ranks of Robert Goddard and Wernher von Braun. The skies of southern New Mexico will once again be filled with astounding spacecraft; this time they’ll carry passengers. Five years ago, the State of New Mexico answered the X PRIZE Foundation’s call for a visionary partner to help host the emerging entrepreneurial space industry, in an unprecedented air and space exposition called the X PRIZE Cup. New Mexico’s combination of motivated, talented people and sincere interest in engaging the nascent space industry made the state a perfect choice, and we proudly formed a partnership. We were fortunate to have found people who shared our passion for a new era of spaceflight. As our relationship with the state grew, we helped to communicate their desire to host entrepreneurial companies in New Mexico. 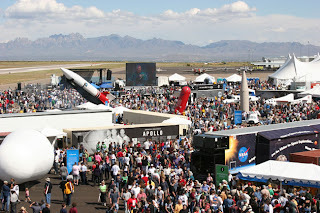 In subsequent years, teams competing for the Ansari X PRIZE, the Northrop Grumman Lunar Lander Challenge, and the Progressive Insurance Automotive X PRIZE have responded by locating major facilities and bases of operation in Southern New Mexico, helping bring high tech jobs and the promise of future visitors to the state. It is fitting that SpaceShipTwo, the descendent of the vehicle that claimed the Ansari X PRIZE in 2004, will call Spaceport America home. Last week’s groundbreaking was the result of an enormous effort by a large number of dedicated individuals throughout New Mexico including Governor Richardson, Secretary Homans, Executive Director Steve Landeene, Spaceport America’s Board of Directors and so many others. A rich tradition driven by a passion to reach for the stars continues as the Land of the Enchantment takes another bold step in fulfilling its destiny in space with Spaceport America. Congratulations!